Description: In 2008 Caroline Ridley established an experiment to investigate next generation effects of genetic rescue on plant fitness. We are comparing fitness (recruitment and survival) of seeds collected from plants in the INB1 experiment in exPt 1. All of the maternal plants in INB1 were open-pollinated and in one of three groups: 1. individuals with parents from a single large remnant population, 2. individuals with parents from a small remnant population (non-rescued), and 3. individuals with parents from a large and small remnant (rescued). Eri and NWLF served as “small” remnant populations, while Lf and SPP were the “large” remnants. Rescued individuals were offspring of crosses using Eri × SPP, Eri × Lf, NWLF × SPP and NWLF × Lf. 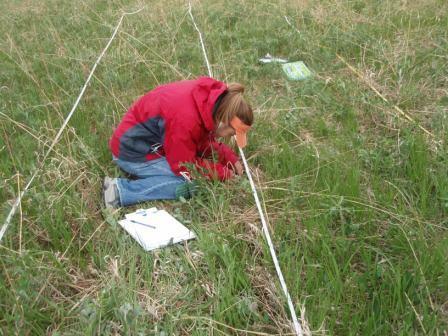 Caroline sowed achenes in an experimental plot at Hegg Lake WMA. The plot (exPt 4) has 3 blocks, each with 2 rows. Sets of achenes (East & West) were sowed in 50-cm segments within the rows. Caroline searched for and marked seedlings with colored toothpicks in May 2009. Team Echinacea assessed late season survival in August 2009. Since then we have annually assessed survival and growth of these plants. When an individual flowers we will measure reproductive fitness! Link to flog posts: Read updates about this experiment written by members of Team Echinacea.